It's been used for thousands of years for hundreds of afflictions but is only now being re-introduced here in ailing North America. It's called oil of oregano and it comes from a plant called origanum vulgares found in the high mountains of the Mediterannean area. This highly venerated and potent oil is pressed or distilled from the ripened plant and bottled or capsuled for use. It takes roughly 200 pounds of the plant to produce 2 pounds of oil so it doesn't come cheap, but it's affordable and safe and effective. In fact it's so potent that only one drop of this oil applied to the afflicted region will effect immediate or fast relief. It contains carvacrol and thymol and other powerful ingredients known to rival or even surpass current antibiotic or antiseptic treatments withoout any of the side effects. What is it used for? Nearly everything. It can be applied topically or taken internally and treats anything from the common cold or flu to candida and yeast infections to shingles, herpes, acne and rosacea, diaper rash, diarrhea, ulcers, parasites, food poisoning, insect or animal bites, bee stings, snake venom, colitis, prostatitis, menstrual cramps, gastritis, tooth aches and gum disease, sore throat, giardia, dandruff, eczema and fungus, allergies, congestion, bronchitis, asthma, tuberculosis, neuritis, headaches, back pain and spasms, arthritis, athelete's foot, warts and calluses, poison ivy, salmonella, and more. It's anti-viral, anti-bacterial, anti-inflammatory, anti-cancer, anti-venom, anti-pain, and anti-whatever-else-ails-you. It also regenerates liver cells and boosts your immune system in general. Oil of oregano comes in oil or capsule form and is taken three to five drops two or three times a day or as often as needed. It can be mixed with water or juice or blended with food or taken under the tongue and then swallowed with liquid. NOTE: oil of oregano in its original form is extremely potent and bitter in taste and may have to be diluted with olive or coconut oil. It can also burn or feel very hot when applied directly to the skin and should not be put directly into the eyes or ears. It also has a pungent smell or lingering odor. Use small or diluted amounts first and build up gradually. 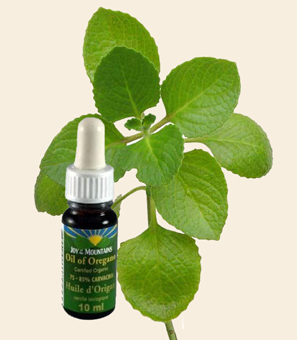 Oregano oil can also be used for your scalp and hair or inhaled for sinus, lung, or breathing conditions. Internal use is especially effective for getting rid of parasites and complements external use. You can buy oil of oregano in any health food store or order it online. Make sure it's wild, organic, cold-pressed, and Mediterannean oil of oregano with a high dose of carvacrol(85% plus). It can be variously priced at between twelve and forty dollars depending on the amount or quality of the oil or tablets.